NorthGate College invites students to apply for admission. The College seeks applicants who are prepared to meet NorthGate’s challenging programs and make positive contributions to the college community. 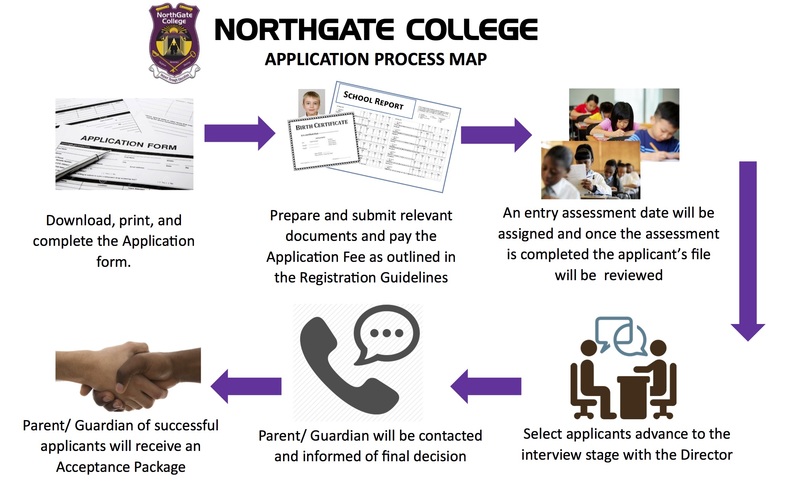 The graphic below details the 6-step application process for all prospective NorthGate College students. NorthGate’s Office of Admission carefully considers each applicant based upon his or her own merits. The decision for admission is also derived from evidence of intellectual capacity, personal motivation and integrity, and consideration of interests and accomplishments in non-academic areas. The minimum age requirement for an applicant is 11 years old by September 1st. Applicants are not required to have completed the SEA examination but must complete our internal Entry Assessment. Applicants can refer to the ‘Admissions’ section, and print the application form. A completed application form must be delivered to the administrative office with the accompanying documents as listed on the website. Alternatively, applicants may collect the application form at the administrative office and will be guided accordingly. The student will be given a written entry assessment for the duration of approximately 2 to 3 hours. The assessment will be graded and all documents submitted will be reviewed to determine eligibility to advance to the interview stage. An interview with the Director will be scheduled at a mutually determined date and time. The candidate and parent/ guardian are expected to attend. The interview will last for approximately 30 minutes. Parents/ Guardians of successful applicants must indicate their acceptance by returning the signed agreement attached to the Guidelines for Parents and Students booklet and payment slip for fees at least one week before the child begins school. At the beginning of each academic year new parents and students will be required to attend an Orientation Programme for the completion of the registration process.